For a different world! | This is a call-out for actions and manifestations on the 22 february 2014 ! 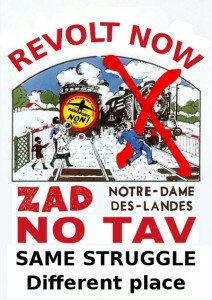 From the ZAD to Val di Susa ! From Hambacher Forst to Taksim Square ! A day of action and sabotage to regain our freedom and rights to take decisions about our own lives, our environment, our planet,( in a emancipated manner), instead of those in position of global decision-making, who are using the flag of democracy to impose their society of totalitarian power. A day of action and sabotage to bring to a halt the destructions and exploitation of entire species, the waste of tons of raw materials and natural resources everyday, justified by the term ‘public interest’, while behind it there’s only money, profit and capital. 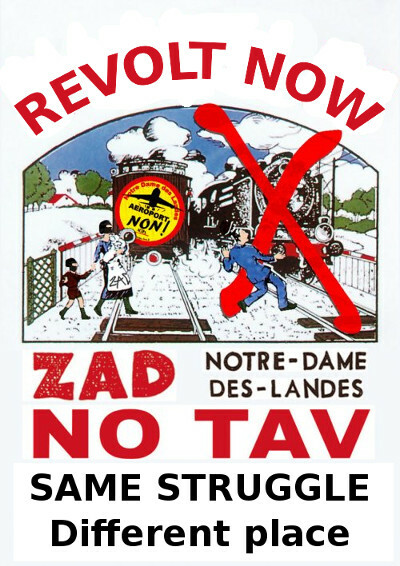 A few persons from a ZAD.